The Goldador is not just one of many designer dog breeds, a current trend in the dog world. Usually, breeders pick two dogs, then put them together to create a unique type of dog. But in the case of the Goldador, two of the top three most popular dog breeds were combined to form an even more loveable pooch. #1 What is a Goldador Dog? #2 How Big Do Goldadors Get? #3 When Does a Goldador Stop Growing? #4 Is the Goldador Hypoallergenic? #5 Is Grooming Goldadors Going to be a Full-Time Job? #6 How to Train Goldador? #7 How Much Exercise Does a Goldador Need? #8 What Health Problems Do Golden Retriever & Lab Mix Have? #9 How Long Can the Goldador Live? #10 How Much Are Goldador Puppies? #11 Where to Buy Goldador Puppies? So Is a Goldador Right for Me? A Goldador Dog is a mixture between a Golden Retriever and a Labrador Retriever. They are also known as a Golden Lab or referred to as a Golden Retriever / Lab Mix. These dogs have the typical sturdy and well-proportioned body of a retriever as well as their personality traits. The Goldador is extremely friendly and affectionate. They’re also excellent watchdogs as they like to keep an eye on everything going on around them, but they’re far more likely to greet any strangers with a tail wag and a kiss than any aggression. Despite their large size, Goldadors are among the best family dogs because of their easy-going personalities. Because a Goldador is half Labrador, these two share a number of similarities but have some differences as well. The three types of Labs. Labradors always have a short coat whereas Goldadors may have longer, wavy fur. 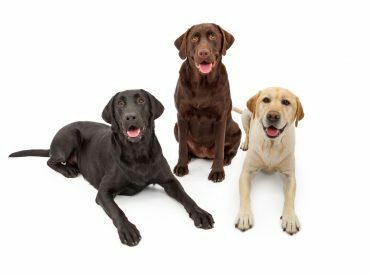 Labradors have breed standards defined by the American Kennel Club (AKC) but Goldadors do not have standards as they are not an official breed. Goldadors can stand between 22 and 25 inches (56 – 62 cm) at the shoulder. With their average build, they weigh in between 55 and 80 pounds (25 – 36 kg). Males are typically on the bigger end of that scale with females on the smaller end. These are considered a large breed, so you need to be prepared to buy a lot of dog food when you get a Goldador! You may also need a bigger bed if you let them share your bed at night as they’re likely to take it over. Large breeds of dog grow more slowly than their smaller cousins, and that’s not a bad thing. Goldadors tend to stop growing around 18 months. The reason it’s a good thing that they grow slowly is that Golden Labs are prone to hip dysplasia. This condition causes the hip to not remain in the hip socket as it’s supposed to. When a puppy grows too quickly, this joint isn’t able to form correctly, putting the dog at a higher risk of developing it as they get older. One of the most important things you can do for your Goldador puppy is making sure they’re being fed a proper diet as a puppy. They need to have foods that are low in calcium and high in glucosamine. This Golden Retriever / Lab Mix always inherits the double-coat of the Labrador, which means they have extra fur that kicks up plenty of allergens for those who are allergic to dogs. The truth is, there aren’t any breeds of dogs that are entirely hypoallergenic since many people are allergic to their skin, but there are some that are better than others. Because of their double-coat, the Goldador should be groomed regularly, especially in the spring when they begin shedding. However, it shouldn’t take up too much of your time. If your dog has the short coat of a Lab, you may only need to brush them 1 – 2 times per week throughout most of the year. If they’ve inherited some of that long, wavy, Golden Retriever fur, then you’ll need to brush them 3 – 4 times per week for most of the year. During the spring shedding season, you’ll likely be brushing them every day regardless of their hair length. 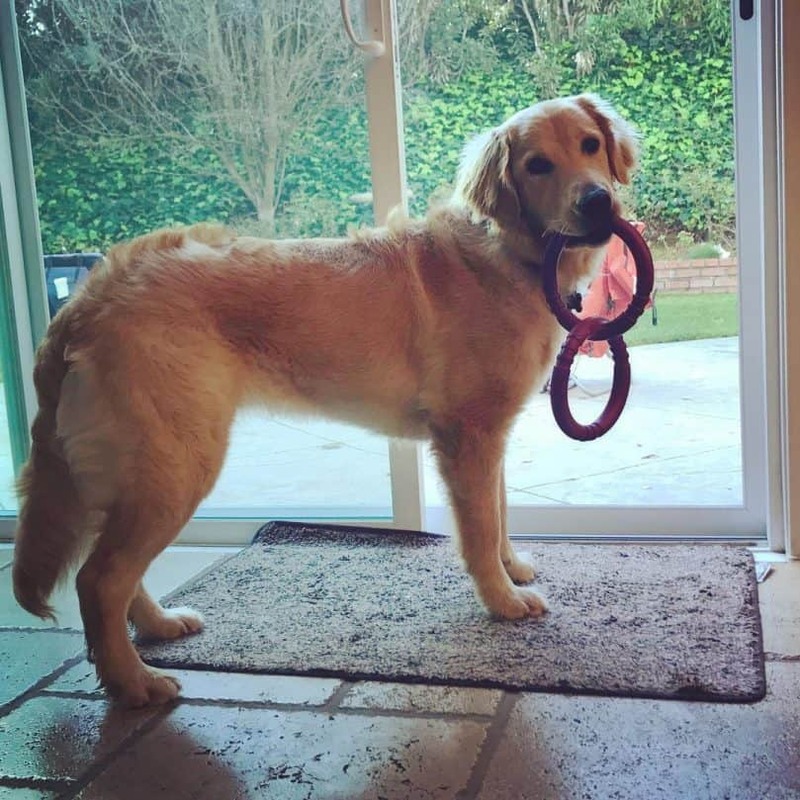 Even though these are intelligent dogs that are great for families with small children, you still need to put time into training your Goldador. The earlier you start the training process, the easier it will be for everyone involved. Because both parent breeds were bred to carry things, the Goldador can be mouthy and may pick things up that they’re not supposed to. Mouthiness is an important habit to break when they’re as little as possible, so they’re not putting their mouth on people as they get older and have more strength. Be sure they have plenty of toys of their own that they’re allowed to pick up so they can fulfill that desire without going for your shoes. Goldadors are a sensitive type of dog, so using positive reinforcement is the best way to train them. Punishment will only make it harder to teach them what you want since they will start to fear you rather than respect you as their leader. As often as possible, praise your puppy when they do something right. Set up rules that they can follow and then reward them for following them, even when it’s something as minor as waiting to the side when you open the door for them to go outside. While puppy classes might be a fun way to socialize your Goldador with other dogs, it’s probably not the best learning environment for them. These dogs are easily distracted, so they need a quiet place to learn. This video features a Golden Retriever, but it proves our point that these dogs are VERY easily distracted. It’s one of my favorite videos on the internet. Enjoy! As you can also see in the video, Golden Retriever / Lab Mixes are quite active. They need at least 2 hours of physical activity every day. Because they’re intelligent, active dogs, they will get destructive if they get bored, so exercising them regularly will help keep everyone happy. If you don’t have at least 2 hours a day to devote to their exercise, then you might need to hire a dog walker. If you’re not the walking type, don’t worry. There are plenty of outdoor activities that you can enjoy with your dog that will get you both out of the house and into the fresh air. Or, if you have kids, make playing with the dog one of their responsibilities. This guy is ready to play! Despite the many benefits of owning a Goldador, there are some drawbacks. 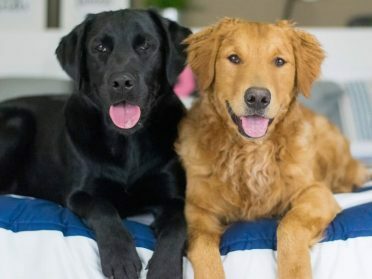 Both Labs and Golden Retrievers have several health problems that can potentially be passed to their Golden Lab puppies. Elbow and hip dysplasia. As previously mentioned, this is a malformation of these joints that results in the bone not being in the joint properly. Cruciate ligament injury. Another health problem that Goldadors can run into is cruciate ligament injury which involves the knee joint on the hind leg. Eye problems. This mixed dog is prone to several eye problems, including progressive retinal atrophy which can lead to blindness. Diabetes. In dogs, this disease requires regular blood sugar level checks and may need insulin injections as well. Hypothyroidism. This condition is hereditary and causes the thyroid to slow down which leads to low energy, weight gain, and hair loss. Skin conditions. Ear infections and skin allergies are among two of the most common skin conditions that your Goldador may experience. In the case of allergies, you should always have them tested to be sure it’s not a preventable food allergy. Obesity. If you feed these dogs too much and exercise them too little, then there’s a good chance that they will become obese. In dogs, obesity can lead to a higher incidence of elbow and hip dysplasia, and cruciate ligament injuries, which makes it even more necessary to control your Goldador’s weight. 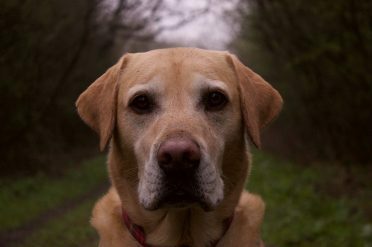 Despite their risk of developing the aforementioned health conditions, the Golden Lab can live between 11 and 14 years. To give your best friend the best chance at living for as long as possible, make sure you’re providing them with high-quality dog food and regularly taking them to the vet. Your vet can help monitor your dog’s health and start treating conditions when they are still minor problems. Early treatment gives the best outlook for your Golden Retriever Lab Mix. 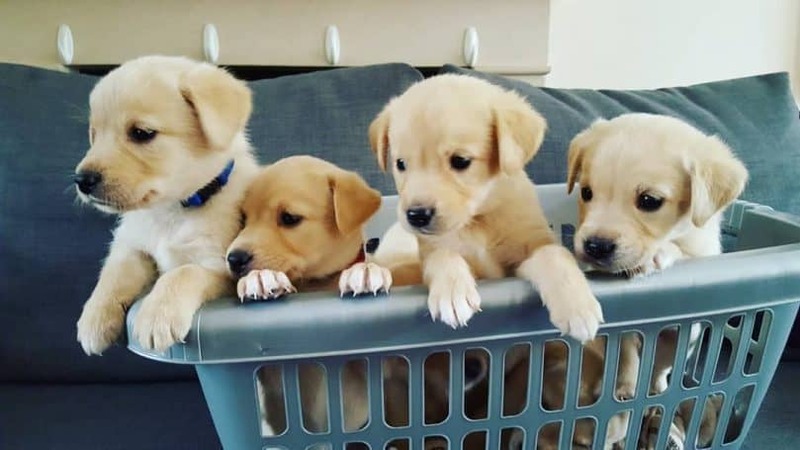 The price of Golden Lab puppies varies greatly depending on the parents and the puppy. On the higher end are puppies intentionally bred to be high-quality dogs fit for breeding. These will likely have parents registered with the American Kennel Club (AKC). Top-quality Goldador puppies may sell for up to $4,500. If you can’t spend that much, look for ones considered to be “pet quality” puppies. These dogs may not have the physical or personality traits that the breeder wants for future generations. Or, they may be the result of an accidental breeding between two purebreds, but unregistered, dogs. These will cost around $400. Overall, the average amount that you can expect to pay for a Goldador puppy is $600. Have a healthier puppy. Puppies that come from good breeders are raised in homes or else nice kennels and are healthier because they are taken to the vet when they are young. Responsible breeders also check for early signs of hip dysplasia and other genetic conditions to reduce the chances of inherited diseases getting passed onto your puppy. Get a better idea of personality. Since much of a dog’s personality is inherited, seeing the parents and siblings of the puppy you’re interested in will give you a better idea of what you’re taking home with you. Support a family. Rather than buying from a puppy mill that treats animals like products, buying from a small in-home breeder will support a family that’s not only looking to make money off of puppies but wants to improve the breed. Guarantee a home for your dog. If things don’t work out with your Goldador for some reason, a good breeder will take them back at any point in their life. That means you never have to worry about your dog having a good home. If you’re looking for an energetic family dog that loves everybody they meet and is easy to train, then the Golden Lab may be the right dog for you. I hope this answers all of your questions about the Goldador and helped you figure out if this crossbreed is right for you! What do you think about this impressive breed? Share your thoughts and experience in comments below! IF I bred my Dark golden retriever with my chocolate lab, what color would the puppies be? The sweet Goldador I had was a ridiculous shedder! His hair was everywhere even with regular brushing. He was also a colossal brat but I adored him. Sadly he passed from stomach cancer this year.